The good vibrations from a group drumming to improve their mental health have been recognised in Europe. The Buddy Beat based in Renfrewshire in Scotland are in Ljubljana, Slovenia after being named among the final five finalists for the first Amateo Award. Nearly 50 projects from 16 countries competed for the award which celebrates exceptional amateur arts projects that have had a profound impact on their community. The shortlisted projects represented work from Denmark, Slovenia, Belgium, Netherlands and Scotland. All five will be represented at the announcement of the winner on the 10th May in Ljubljana, as part of the Amateo Conference ’Before You Say Yes’, hosted by Amateo member JSKD in Slovenia. The Buddy Beat has been beating for 10 years in the heart of Johnstone, one of the most economically-deprived areas of Scotland. 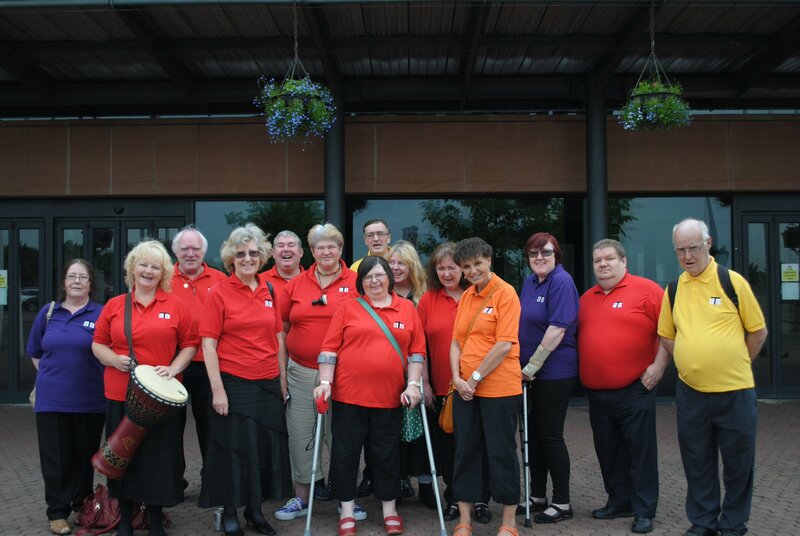 Members meet once a week to drum and make music, gaining confidence in both their artistic and personal skills. They also regularly perform and lead drumming workshops in care homes fighting loneliness with good rhythm and company. Amateo, is the European Network for Active Participation in Cultural Activities in Europe. The Network was founded in 2008 as the multi-disciplinary European organisation within the field of participatory arts and cultural activities. There are 32 national and regional umbrella groups and associations from 12 EU member states and 2 programme countries, with contacts to a huge network of regional and local associations within the European field of amateur arts. Amateo sees active participation in the arts as a core value for a free and open society as enshrined in Article 27 of the Universal Declaration of Human Rights. Amateo’s new programme Arts Take Part – supported by Creative Europe – aims to grow and strengthen the network over the next four years. As part of this new programme and to celebrate its 10th anniversary, the first annual Amateo Award is being presented to celebrate participatory arts in Europe. “The shortlisting jury for the first AMATEO Award considered 42 eligible applications from creative cultural projects in 16 different countries. The range of projects was startlingly diverse from established large scale events involving thousands of participants, to innovative, new, first-time-out projects led by individuals. I was amazed by the breadth of diverse applications in this our first AMATEO award and it was very gratifying for the jury to have such a breadth of high quality applications to consider”. The winner of the Amateo Award will be announced on May 10 in Ljubljana at a ceremony celebrating the start of Slovenia’s annual festival celebrating the amateur arts, hosted by JKSD.